Mayor Linin led the Pledge of Allegience. 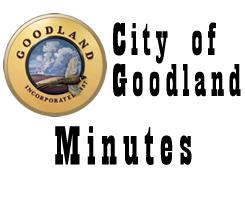 Commission Workshop: Goal Setting and Strategic Planning – The Commission discussed priorities and goals for the future of the City of Goodland. ADJOURNMENT WAS HAD ON A MOTION by Commissioner Garcia seconded by Commissioner Fairbanks. Motion carried by unanimous VOTE, meeting Adjourned at 7:30 p.m.